Home sales across Canada fell by 6.2 per cent in June, largely on the back of a huge decline in Toronto, the Canadian Real Estate Association reports. The Greater Toronto Area experienced the largest decrease in sales, with 6.7 per cent fewer homes trading hands. This greatly contributed to a downturn in two thirds of Canadian local markets. Amidst tales of frenzied bidding wars, potential home buyers in the GTA now seem to be moving to the sidelines, delaying their purchase decisions as they watch the city’s housing market slow significantly. [home_insurance_square_widget]TREB’s numbers reveal prices reversed their upward trajectory for the first time in years in May. While it’s unknown how long this trend may be last, it seems to be felt hardest in the detached segment. Once the most highly-sought type of housing in the city, there were 26.3 per cent fewer sales in June. Toronto townhouses decreased by 18.1 per cent, with Toronto condos easing 6.4 per cent – indicative of the demand downturn, but much less dramatic than their low-rise counterparts. However, that doesn’t mean housing is getting any more affordable in Toronto; prices were still up 14.9 per cent from last year. However, they did soften by 6.2 per cent between April and May – the first month of data recorded following the Ontario Fair Housing Plan rules. May is typically a strong month for sales as buyers become more interested after the winter, but that’s not the case this year. “Recent changes to housing policy in Ontario have quickly caused sales and listings to become more balanced in the GTA,” CREA president Andrew Peck says. 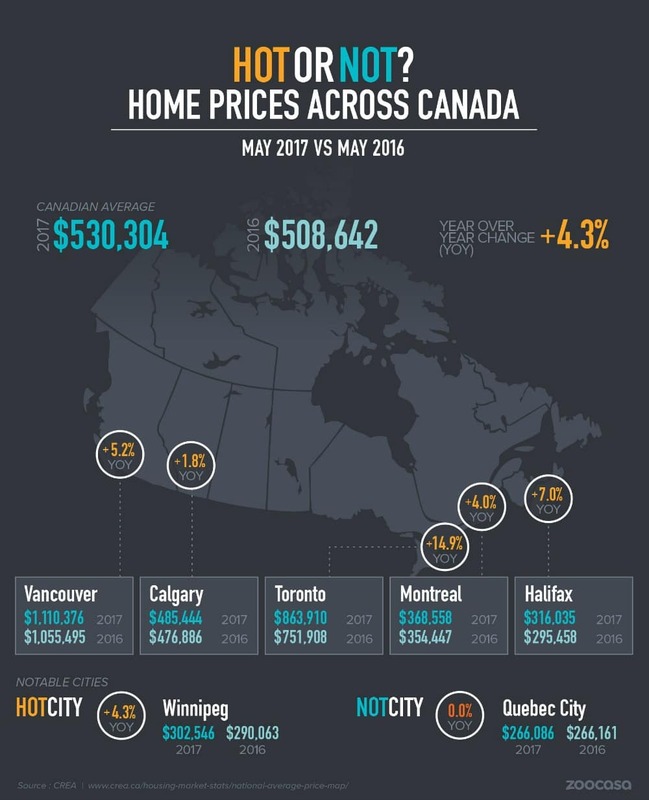 The drop began in earnest after the Ontario government introduced new regulations – which included a 15 per cent foreign buyer tax, rent controls, and a crackdown on speculators – in April to cool the housing market, particularly in the GTA. Despite this, observers feel most sellers are still expecting to cash in on years’ worth of impressive returns. If they feel they aren’t getting their price, the majority will wait until a motivated buyer comes along, opting to stay in their house a bit longer. Buyers, on the other hand, are hoping the recent trend continues but that could change in the months to come, due to a strong herd mentality in the real estate market, Jason Mercer, TREB’s director of market analysis suggests. There are signs that the pace of growth in the GTA may slow a bit further. While year-over-year numbers show Toronto real estate is still historically strong, Zoocasa.com took a look at month-to-month data does highlight the slowest spring performance since 2013. The numbers show that while the market always experiences a flood of listings between March and April, available homes for sale rose 27 per cent during that time period this year, before increasing a further 19 per cent from April to May. Sales, meanwhile, fell 4 per cent from March to April, and 12 per cent last month, respectively. The condo segment, while not as drastically impacted, has also seen some softening as well, with 15 per cent new listings in May, 5 per cent fewer sales, and prices down 2 per cent across the GTA region. “If new listings growth continues to outpace sales growth moving forward, we will start to see more balanced market conditions,” Mercer expects, predicting that it may take a number of months to unwind the substantial pent-up demand that has built over the past two years. Zoocasa CEO Lauren Haw agrees – up to a point. Zero to five months of inventory generally signal sellers’ conditions, while five to seven months are indicative of a balanced market, she explains, pointing out that in the medium term, the market has reached the same levels seen in the second quarter of 2016 – namely extraordinarily hot price and sales growth.